Are You Interested in Becoming a Donor? Please fill out this form & thank you! If you like, please share your story or reason for wanting to become a kidney donor. This is not required but we love hearing the many different reasons people have! If you send us an inspirational story, we would love to post it on our website and/or social media. Just so you know, we would remove all names and personal information beforehand. We always give credit as "Submitted by - First Name." If you leave it blank below - it defaults to "No"
Thank you very much for your interest. Someone from our team will be contacting you shortly. A Must Watch - We at Donor To Donor, often post blogs and portraits of living donors, recipients and deceased donors and their families. We never hear much from the surgeons and health care workers who do the transplant surgeries. Here is an amazing 35-minute podcast from NPR that is well worth your time from a transplant surgeon, Joshua Mezrich at University of Wisconsin School of Medicine and Public Health. Please give it a listen and share. Are you between 13-30 years old? Have you had a Kidney Transplant? Do you use social media & apps? Johns Hopkins Children's Center wants to hear from you. Johns Hopkins is in the process of building a new digital tool to help with the transplant process. That's where you come in. 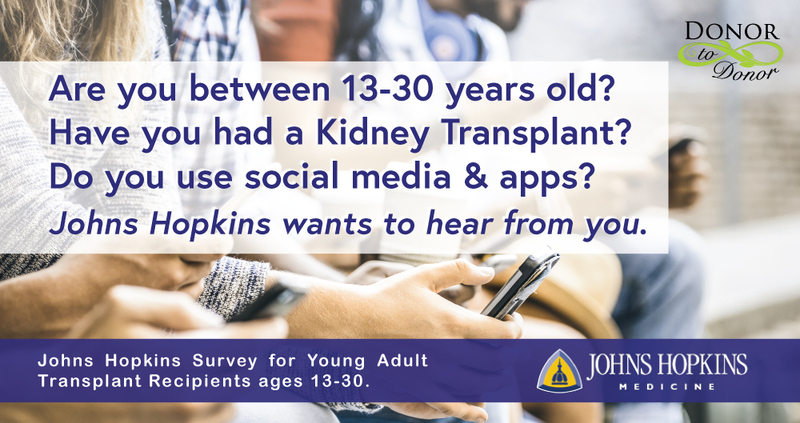 They want to know more about how teenage and young adult Kidney Transplant recipients use apps and social media. 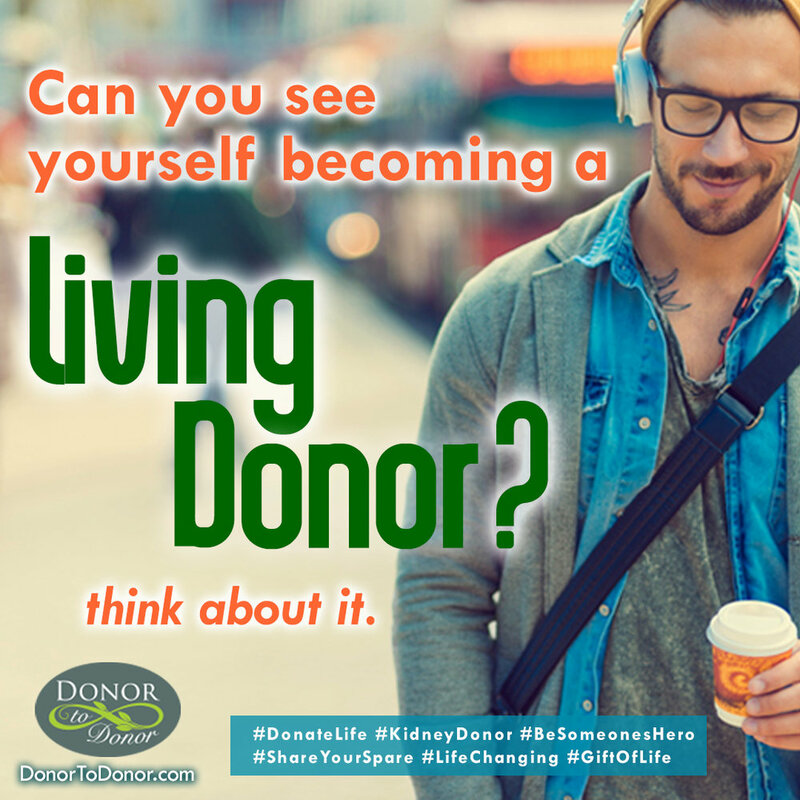 Donor to Donor is a program devoted to ‘Living Kidney Donor Awareness’, the #ShareYourSpare movement is growing and that means, we’re making progress for everyone needing a kidney! the battle he’s going through? Click the picture below to learn more about his story & find out how you could help. Click on the image above to go to our NDD page for more info. A new program allows people to donate organs to a total stranger in exchange for a voucher. That voucher can help a loved one bypass years of waiting on the transplant list, if they are ever in need of an organ. CNN's Dr. Sanjay Gupta reports. 3 families help save 6 lives after man diagnosed with kidney disease. FORT LAUDERDALE, Fla. - A South Florida woman has made it her mission to spread the word about living organ donation and how people can save a life by donating something they don't really need. For years, only close friends and family knew that Neil Emmott had kidney disease. Read More HERE. Kidney transplant chains enable willing donors to give kidneys to strangers as long as they’re a good match. Now Megyn Kelly welcomes some of the many members of a transplant chain that’s 46 donors long, and still growing. Watch as kidney recipients meet the donors who gave them a new lease on life for the first time. This was a post on our Facebook page, Margaret became an organ donor and is giving the gift of life! Imagine you're sitting in a boat wearing two lifejackets. You realize a person is drowning in the water next to you. Would you give your extra life jacket to save them? How about your kidney? Sign up & learn more. In the US, over 100,000 people desperately need a kidney. Each year, Kidney disease kills 2 million Americans - 28 times the number who die from breast and prostate cancer combined. Did you know that YOU can donate your spare kidney to save the life of a stranger, because you only need one of them? Even if you're a registered organ donor, fewer than 1 in 500 donors die in a way that allows organs to be transplanted. 100,000 people need this life-saving transplant, but each year fewer than 200 people donate their kidney to a stranger- That's fewer than the number of astronauts who have been to the International Space Station. Why? Because there's one thing people DON'T know: Your donation could save multiple lives. Though thousands of people receive donations from friends or family every year, many others don't have a match; this leaves a "chain" of matched pairs waiting on your donation to set off the reaction for the chain to start! Living kidney donation is the gift of life and is entirely paid for by the recipient's insurance. Think about it, consider saving a life and #shareyourspare! Soon to a LIVING KIDNEY DONOR! Laura knew, after seeing a Facebook post that she wanted to donate her kidney. I am one week away from being a non-directed living kidney donor. That is, I am donating one of my healthy kidneys to someone I never met before, someone I don’t know, living several states away. All I know is that he or she needs a kidney in order to live and we are a match! I will actually be the first person in a 4-person kidney donation chain. This is because my recipient has a friend or relative willing to donate but does not match with him. Therefore, I will be donating to my match, and his friend or relative will donate to someone else on his behalf. This second kidney recipient has a friend or relative who will then donate on to a third person on his behalf and so forth. In total, there will be 8 surgeries, and 4 people who are waiting on the National Kidney Registry (NKR) getting new kidneys. And as for everyone else on the NKR, they will move up 4 spots on the list. Although this seems ironic, I can’t help but feel that I am getting the better deal in this whole arrangement. Sure, I am giving a stranger one of my healthy kidneys, but I feel like I am getting back so much more. In fact, I don’t know the last time I have done something that seems so self-serving. My friends think I’m crazy and tell me what I am doing is the complete opposite: totally selfless. But, let me explain. Several months ago I came across a Facebook post my sister shared. It was a plea. A mom was trying to find a kidney for her 16-year old child and time was running out. Having a 16-year old child myself, I was instantly drawn to the post. I started clicking on the links and reading about what it takes to be a kidney donor. As if struck by lightening, I realized, “I can do this!” It seemed like common sense. Not some huge undertaking, but something so necessary and relatively easy to do. I signed up. In fact, the image that keeps popping up in my head is one of a giant warehouse in the middle of a desert. From wall to wall and up to the ceiling, it is filled with food. Outside the warehouse are people starving but the doors to the warehouse are locked! To me, this image represents all the people dying every day as they wait for a healthy kidney - while busy people walk by them with two healthy kidneys, when they only need one. I feel I am a perfect candidate. I am 51 years old and not planning on having any more children. I am healthy and fit, working out at Orange Theory Fitness several times a week, snowboarding and playing ice hockey. I have a great support system and a flexible work situation. Having had 6 previous surgeries for sports injuries and c-sections, the idea of another surgery didn’t bother me. If I couldn’t do it, who could? I’ve always admired organ donors and I feel that this is my time to walk this walk. And what did I receive in return? Empowerment. Purpose. Euphoria. Community. Empowerment. At times I feel completely overwhelmed at the state of the world. The hatred, hunger, fear, violence, a deteriorating environment, the insidious political divisiveness. The problems seem too great for one person or even many people to solve. It can be downright depressing at times. And then I came across this saying: Even if you can’t change the world, you can still change one person’s world. Coincidentally, kidney donation was on my mind. It affirmed my decision to donate a kidney. I felt empowered. I might not be able to change the world, but I could help change one person’s world…or maybe even four. Purpose. I consider myself privileged. Most importantly, I am healthy. Health privilege is more valuable than all other privileges put together. Plus, I live in an amazing community in Park City, Utah. It’s a ski town with limitless access to the outdoors all year round, wonderful schools, friendly happy people. 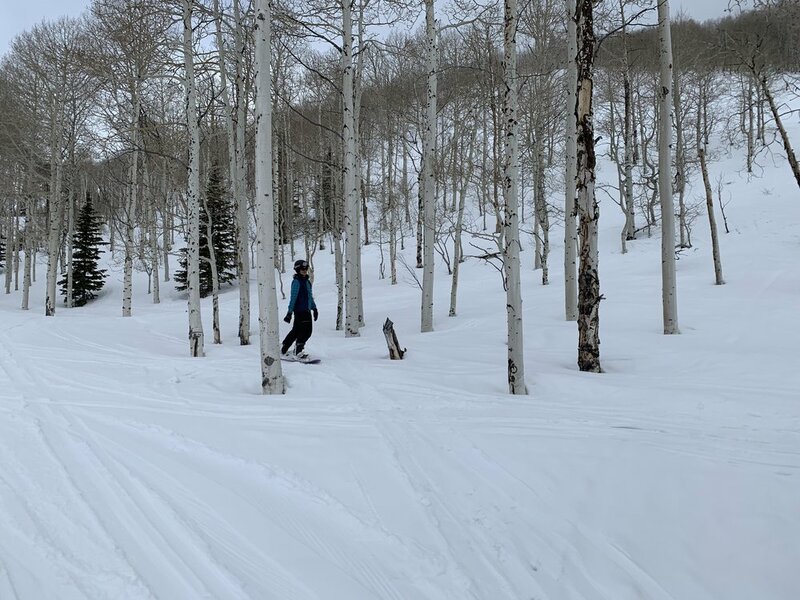 I have a great job as a Mountain Host at Park City Mountain Resort, snowboarding much of the day. I am married and have two awesome kids, a dog, two cats, a bearded dragon and two fish! Life is good. Being grateful for one’s good fortune is important, but I’ve realized that it’s even more important to give back. Giving back gives one a sense of purpose. Donating my kidney, sharing my privilege, has given me a greater sense of purpose and meaning. Euphoria. I have heard this many times. An unexpected consequence of donating your kidney is a feeling of euphoria. I’ve been told that it’s similar to the feeling of giving birth to a baby. I am a week a way from donating and I already know what they are talking about. You are giving life to someone. It feels good. In fact, just this weekend I was driving home from chaperoning a prom. I was driving up the canyon on I-80 and it was pouring rain. I could hardly see. I was nervous and felt especially protective of my kidneys! After all, my recipient is already aware of the match as he/she is also just one week away from surgery. At this point, I feel as if I am carrying someone else’s baby, someone else’s chance at life. Community. Probably the most unexpected gift I am receiving from donating a kidney is community. I had no idea there was even a kidney donation community out there. It is full of euphoric people who are empowered and have purpose! I am one week away from donation and I’ve already met so many of these amazing people across the country. I feel a part of something that is big and full of momentum. Hopefully the transplant is a success. And hopefully I will be able to meet my recipient. And if I do, I will say to him or her: thank you. why are some people so giving? We would like to welcome Abigail Marsh to our Donor to Donor Advisory Board. Abigail Marsh - Photo by Kuna Malik Hamad. I am an Associate Professor in the Department of Psychology and the Interdisciplinary Neuroscience Program at Georgetown University. I received my PhD in Social Psychology from Harvard University in 2004 and afterward conducted post-doctoral research at the National Institute of Mental Health until 2008. My book The Fear Factor will be published October 10th (Basic/Hachette). The book explores the extremes of human nature–from extraordinary altruism to psychopathy–and what processes in the brain drive extraordinarily good and extraordinarily bad behaviors alike. Pre-order now on Amazon or Barnes and Noble. This is a very big day for Richard and a big day for Donor To Donor and our constituents. Richard received his kidney today, thanks to a donation by #DonorHERO Margaret McCormick Preto-Rodas, 12 weeks ago, August 2017. Margaret donated her kidney to save Richards life, and we all owe a big shout-out to the National Kidney Registry, (NKR) for the innovation they created to allow Richard to receive his kidney. Margaret gave Richard a “voucher” for a kidney in a future kidney chain, in return for starting a chain of transplants with multiple recipients. The NKR then put together a chain that enabled Richard to receive his kidney in just 12 more weeks. So, rather than one donor giving a kidney to one recipient, the voucher program triggered multiple transplants! Richard was on peritoneal dialysis for 4 years and hemodialysis for 5 years. He is very lucky – only 35% of the patients survive 5 years on dialysis. 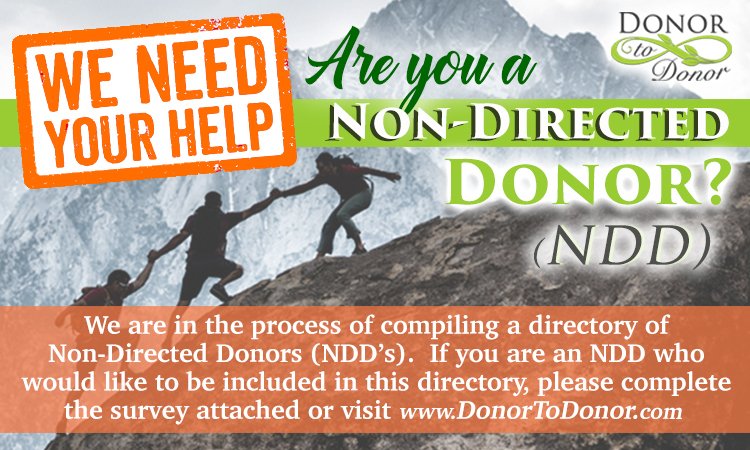 If you have interest in learning more about living donation, becoming a #LivingDonor or the “voucher” program, please do contact via our online form or email nedbrooks@donortodonor.com. Would you like to find out more about becoming a Donor? Are you in need of a Kidney Transplant? Please fill out our info request form here for either donor interest or patient interest.